I stayed at a hotel earlier this week. When I walked into the room, I thought it smelled like a yoga studio. 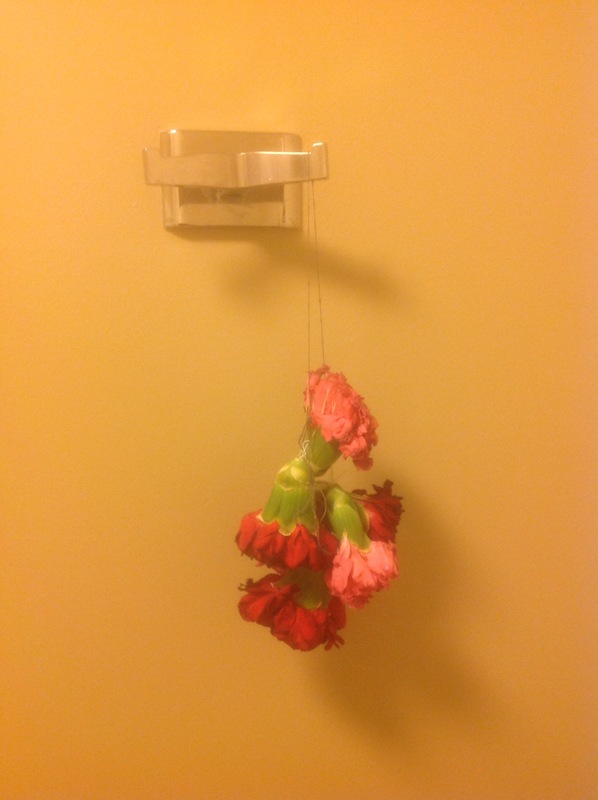 Then I found dead carnations on the back of the bathroom door and that captured my attention. And I shared the news of the carnations with many people at the conference I was attending (as well as my Facebook friends). Today I went to my yoga class, it did not smell exactly like the hotel room although I understand why I made the connection. There were similarities. My instructor talked about the essential oils which were in the diffuser* today. At some point while I was on my mat stretching in a way I do not usually stretch, it all became clear. The yoga studio does not smell the same way each time. Nor am I the same person each time. Today we were a bit silly and chatty in class. Today the room had a mix of tangerine, patchouli, and lavender oils (and maybe something else as well). Today I stretched into certain poses and held them in certain ways. All of that might be different the next time I go to yoga. *Not the diffuser from last week’s yoga post. This one would be a diffuser for the essential oils. Another point to ponder on another occasion is the existence of two types of diffusers in one yoga room.